Some things do indeed get lost to the sands of time, even a mere 30 years on. As a kid, I owned a copy of a unique Adventure International title -- Kid-Venture #1: Little Red Riding Hood, by James Talley, aimed at 4-10 year olds. The game does not appear to be available in any of the online archives, likely because of its proto-multimedia nature, so I'm going to have to go strictly on memory here. The game came on cassette for the TRS-80 Model I, and there were (if memory serves) two sides to the tape. On one side was the game program, loaded in the conventional fashion; on the other, a book-and-record-style narration of the story of Little Red Riding Hood. The game also came with two cardboard keyboard overlays, mapping keys to crude sketches of Grandma, the Wolf, an axe, a basket -- the standard elements of the story. The idea was that young children without touch typing skills could play by simply responding with single button presses -- selecting the right prop or character when prompted would allow the story to continue. The audio narration was, I believe, recorded by the author himself, and used the standard TRS-80 tape drive, with the computer audio jack unplugged so the sound would come through the cassette player's own speaker. I recall that Mr. Talley spoke in a soft southern drawl, beginning: "Hello. My name is James. I will be your storyteller." 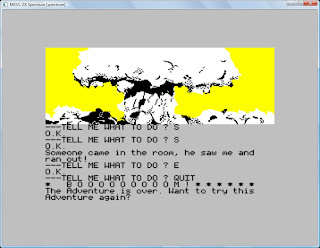 As the story progressed, the player would press the appropriate button and the story would continue. The cassette drive was under computer control, so the narration would pause until the player found the correct answer on the keyboard. There was no way to die or fail, and of course the story was completely linear -- tape was not a random access medium. The game operated in the TRS-80's 32-column mode, so the graphics were very blocky, using big fat 64x48 pixels that were roughly squarish, at least. I don't know whether the style was meant to appeal to children, or save memory, or both. The Adventure International catalog circa 1981 promised a second Kid-Venture to come, but as far as I can determine it was never released, or no evidence of its existence has survived. It was listed as Kid-Venture #2: Match Maker/'Twas the Night Before Christmas, combining what I am guessing was a Concentration-style memory game with a bonus recounting of the famous holiday poem. So chalk this one up as another unsuccessful experiment from the early days of home computer adventuring. But I do remember it well. This game is the last of what I thought of as the "canon" back in the day -- when I first encountered the Adventure series, there were 9 established titles sharing a page in the catalog, and the new #10 had its own separate space on the next page. But for purposes of this project, we'll go up to #12 -- and possibly beyond, although my original idea was to stick with the Scott Adams originals, considering the licensed games and Brian Howarth titles as separate series. I found this one very difficult to play using ScottFree 1.03 for Windows -- there are a couple of puzzles that depend on a flicker of lighting, where the lit view passes too quickly to be visible, and the bonus scoring system doesn't appear to work accurately -- it always seems to read -1 or 0. There's also some different parser behavior that caused one puzzle to be more intransigent than intended. In the interest of being aware of any significant differences, I ended up playing the reliable old TRS-80 Model I version alongside the Windows version. I know there are newer ScottFree versions, but I don't like the non-windowed 2.01 -- I'll have to see if I can obtain 1.14 at some point, looks like I have to go through Debian. Ghost Town is a tough nut to crack in any case -- I had to resort to the official hint book three times! One question made me realize I could go somewhere I thought was just window dressing, which was a huge help. I was on the right track with the other two, but the ScottFree parser was misleading me about the viability of one solution, and the hint book didn't tell me anything about the last one that I hadn't figure out already. I ran into the same dead end in both interpreters, and finally had to look up a walkthrough online to find the missing steps. More details on all of these challenges are in the SPOILERS section below. The map is very outdoorsy -- most buildings are just a single room. I found my way into the ravine -- there was too much detail given about the sagebrush for it NOT to be a puzzle -- but didn't realize I could get to the mountains across the ravine until I consulted the hint book. Afterwards I am carrying "Male cow manure." For a moment I thought the parser was recognizing bull**** as a synonym, but I think that was a ScottFree anomaly. Finding a place to sleep at night is important -- the player character catches pneumonia very easily. Making the gunpowder was fun -- finding the charcoal and sulfur wasn't difficult, but finding the potassium nitrate was more of a challenge. The worn-out fiddle strings found in the saloon after the first night are a neat clue to the ghostly goings-on after hours. A really fun idea, this one. A quintessential Adams object pun -- finding an *ORIENTAL GO BOARD* and a clue in the Jail paves the way to PASS GO and collect another treasure: two hundred dollars. The *GOLDEN DERRINGER* is a non-violent sort of weapon -- it shoots water, but is still sufficient to frighten the Rattlesnake away. A couple of "magic words" are employed that aren't mentioned in the game, but should come readily to anyone familiar with old Westerns. SAY GIDDYUP to ride the horse; SAY HOW to get help from Geronimo's ghost in returning to town. I struggled quite a bit with this puzzle. I got the horse shoed, and got him to take me to the Indian Village, but then he bucked me off and left me there. Thinking I was putting too much weight on his back, I rode without inventory -- no difference. I tried to use the compass somehow to find the magnetic horseshoe, now attached to the horse -- no luck there. I tried dropping the bell on the horse so I could hear him from a distance. Nope. So I started looking for a solution in the local area, using the *SACRED TOM TOM* treasure. I had the right idea, but this is where ScottFree tripped me up a bit -- I tried to PLAY DRUM/PLAY TOM, and got I can't do that yet. I tried HIT DRUM -- I don't understand your command. I consulted the hint book -- I was doing the right thing, or trying to. Finally, I realized that HIT TOM works after trying it on the TRS-80, where I got clearer guidance -- the interpreter explicitly told me it didn't recognize "DRUM". Whew! I was stuck trying to get the safe open as well. I had made the gunpowder, and put it in a keg to keep it from burning up with a Whoosh! But I wasn't having any luck igniting it safely -- I couldn't make a fuse out of tape and manure, or wire it to the telegraph key with the worn-out fiddle strings. I couldn't use the candle and let it burn down to the gunpowder, or leave the lit candle in the telegraph office and roll the keg through the door. So I was stuck. Again I resorted to the hint book, and learned that the mountains across the ravine are not just scenery, but are in fact accessible. It took me two hints to get the right idea -- clue 1 was CROSS RAVINE, clue 2 IT IS NOT WIDE. Aha! After a quick JUMP RAVINE, I found a line shack with *PELTS* hidden in the floor, and another Telegraph key. Aha again! Maybe I could use the telegraph key here to set off the gunpowder there. Hold my ears, tap the key and... nothing? Back to the hint book, which didn't help me -- it just confirmed this was exactly the right thing to do. Was it a ScottFree issue? Nope, the TRS-80 acted the same way. The gunpowder was in the keg, in the telegraph office where the safe was. I was doing exactly what the hint book indicated. What was I missing? I finally broke down and found a walkthrough online. It was, in the end, a visualization problem -- I was picturing the "Large safe" as a built-in wall safe, not a free-standing safe. I hadn't tried to MOVE SAFE -- when I did, it exposed 2 loose wires. CONNECT WIRES, go back to the shack, TAP KEY -- boom! I found the smoking safe where the telegraph office used to be, and grabbed the final treasure. SCORE! Next up... yowza. I've been nervous about this one -- it's Adventure #10: Savage Island (Part I) - for experienced adventurers only! But we've come this far -- and we certainly have some experience now. There's nowhere to go now but into its puzzley jaws. The Great Scott Project ventures into enduring text-ploration territory with Adventure #8: Pyramid of Doom, by Scott Adams and Alvin Files. The game features numerous traps and a few random deaths, and the map is quite extensive for a cassette-based title, with no mazes to pad it out. I had never played this one before, but I didn't find it to be too difficult to solve -- at least, the hint book did not come into play. Most of the puzzles make some sort of sense, although there's one solution I happened on by sheer dumb luck (more on that later). There are 13 treasures to find, and while the player's flashlight never seems to go out, plenty of terrors explicit and subtle keep the danger level high. I can't recommend this format for anything more than a quick sample -- if that suits you, check it out before continuing here. Otherwise, give it a serious go elsewhere if you wish, before letting me spoil anything. I like the opening approach -- there's no trackless waste of desert, no map/compass puzzles, no obstinate camels to delay the Adventure proper. We're already near the pyramid and can focus on getting in. The opening left me a little flat at first, until I figured out how to turn off the giant stone trap. Another vintage example of getting evocative mileage out of minimal text -- a pole stuck in the sand turns out be a shovel once it's in inventory. I didn't notice that immediately, and it was a pleasant discovery even after the fact. A theme-appropriate touch -- the treasure room is easily found, but one has to read the hieroglyphics to learn that it IS in fact the treasure room. I never quite understood the function of the Small Nomad. Shooting him made him disappear in a puff of yellow smoke, but I never felt like that was a good thing, so I restored my game and allowed him to hang around through the whole adventure. He did warn me away from the Purple Worm, so I thought perhaps he was on my side, but he was also ready to jump me and steal my treasures on rare occasions. I think I was supposed to dispatch him, but he didn't make a nuisance of himself. The game has lots of creepy props and monsters -- a chopping block, a mummy, starving rats, a decapitated skeleton -- and lots of useful tools -- rope, pistol, saw, iron glove. There are lots of options for solving puzzles, and several objects have multiple purposes, which I like -- it always seems more "realistic" to me and motivates careful inventory management. There's one puzzle I probably would have had to go to the hint book for, had I not solved it by sheer dumb luck. I happened to be carrying the skull and dropped it in the room with the decapitated skeleton, while considering possibilities for some sort of beheading trap. Magically, the skull attached itself to the skeleton and pulled down a ladder. Who knew? I never did figure out whether there was a way to kill the Purple Worm, but after trying out several ideas, leaving its portal closed in the first place proved the best option. I didn't have to conquer it to finish the game, at least. Most traps are hidden with no forewarning -- frequent use of SAVE GAME is advisable. For example, you need to look in the rubbish once to find a treasure, but looking through it twice contracts an instantly fatal case of dengue fever. The jerky can be used to feed the Giant Oyster or the Starving Rats. It's better to use it to feed the Oyster and obtain the *BLACK PEARL*. After that point it's possible to use the nearby Archway, and avoid the ignominious and grammatically awkward "Rats attacks! I'm dead!" scenario. A large table can be taken, making a strange sound when it is. I tried a number of things before applying the saw to it, yielding a treasure. That iron glove is pretty handy -- it can be used to break brick doorways and protect oneself from needle traps. Another very subtle clue that I at first thought was a bug -- the *RUBY* found inside a lump of coal doesn't get counted as a treasure when it's dropped for SCORE. I found its real purpose later on while dealing with the Iron Statue; I guess the asterisks just make it look shiny! The mirror room puzzle is neat -- it forces turning off the flashlight. Taking a few risks and moving in the dark yields an additional treasure. Again, SAVE GAME comes in handy. Favorite interpreter response I hadn't seen before: "You be weird. Cut that out." The map is fairly open, and aside from some traversal challenges the treasures need not be found in any particular order. Thirteen treasures seems like an awful lot to find at the start of the game, when everything seems barren and dead. But they are hidden here and there, emerging as the map unfolds. This one wasn't too difficult to get through -- three hours, I think, though I can see Savage Island looming in the distance now and am pretty sure I won't be keeping this pace up after I get there. Before we arrive on its challenging shores, we'll saddle up and tackle the last of the drawn-cover-art era: Adventure #9: Ghost Town. Back on earth, the Great Scott Project continues apace. 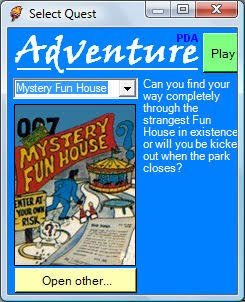 We find ourselves in a mysterious amusement park for Adventure #7: Mystery Fun House. There was a tourist attraction by the same name in the Orlando, Florida area, not far from Adventure International headquarters. The real-life Mystery Fun House is now defunct, but it operated from 1976 to 2001 and would have been fairly new when the game was released. From what I can discover, Scott Adams' game does not appear to be based directly on the attraction -- the magic mirror and rotating barrel rooms could have been based on its namesake, but these are very standard fun house elements. 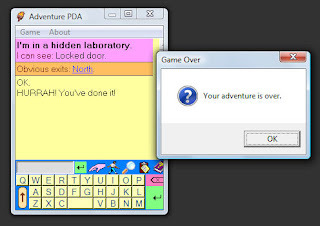 I played this one on realeasterbunny's Adventure PDA -- I don't have a Windows Mobile device, so I used the PC version. It's very cool, with some nice efficiency features -- even on the PC where a full-sized keyboard is available, it's handy to have the clickable hyperlinks on directions and inventory items. The text window is too small for some games, forcing frequent manual scrolling to read lengthier game responses, but this wasn't a problem for Adventure #7. 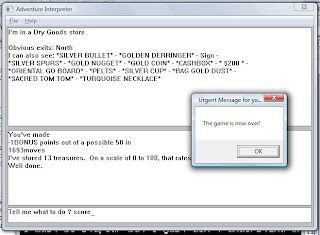 I also discovered that an inventory limit not enforced by the ScottFree version I'm using is properly handled by this interpreter, so it may provide a more authentic experience. This is a mission-style Adventure, with a specific objective and no treasures to find. The player is equipped with a watch, and turns count down from 599 to midnight, when presumably the game ends in defeat (being kicked out of the park, presumably). I didn't actually run into the time limit -- death was a bigger risk than time. I didn't find this to be an easy game at all, although it's not as tricky as The Count. I had to hit the hint book once when I got stuck near the end of the game. Solving this one is mostly a matter of learning one's way around the game, experimenting with objects, and doing things in the right order. The solutions are intertwined, and there are definitely puzzles that should not be attempted (or solved) too early. I had to draw a map for this one -- it's a fun house, after all, and connections aren't always logical. But it's internally consistent -- signs make sense, and rules are enforced. There's also an interesting unlicensed plot development that the promo copy doesn't hint at, though the cover art certainly does. Once again, I suggest that you read no further until you at least consider playing the game yourself before listening to me ramble on. An interactive art form only truly exists when a player is involved; everything else is just commentary. The in-game ads appear to have ceased with this release -- at least I didn't find any promo for #8 within the game. By this time, Adventure International was running full-color magazine ads, so perhaps these had outlived their kitschy usefulness. It's also unlikely that many players really tackled the whole series in order, so perhaps the "next game" wasn't necessarily what any given person would actually be buying next. The fun house has a bouncer -- I got myself thrown out for vandalism, lack of ticket, and improper footwear. Unlike some of the earlier Adventures, this title enforces use of the spectacles with the magic mirror to discover something new -- a priori knowledge of the door embedded in it does not allow opening it up. The player actually has to fetch and wear the spectacles to discover the door, no shortcuts allowed. The game has a lot of red-herring locked doors -- only one of them can be opened with the game's available key. It creates a sense of mystery, but does make the ending seem rather abrupt when one is still anticipating opening all those doors! For some implemetation reason, the POP explosion timing seems to play out at the proper speed in both ScottFree and Adventure PDA -- the pause is at least noticeable, I didn't see the same issue I saw in The Count. The player's chewing gum proves incredibly versatile -- courtesy of "Q" via an unlicensed James Bond reference. It's consistent with real world gum -- it sticks, and it blows. Up. I had a bit of old-school difficulty getting the fuse and gum together to blow the grate. The gum has to be stuck on the fuse, then stuck on the grate; there's no way to stick the fuse in the gum, or to attach the gum to the fuse after it's already been stuck to the grate. I never did understand why sometimes in one room I feel a gentle blast of air, but occasionally I receive a hard blast of air that actually "rips my body apart". That's some pneumatic force! I also never understood why one hears space opera music after pulling the yellow knob. There's a neat puzzle involving a sign that has to be moved -- the first time I've seen a Scott Adams puzzle dependent on someone ELSE's reaction to a posted sign. We're used to this kind of thing in modern, dialogue-driven comedy adventures, but I was completely on the wrong track with this one. Once again, the official hint book gently nudged me in the right direction. Ta-dahhhh! That was Fun, and mysterious, and, er, housey, as promised. 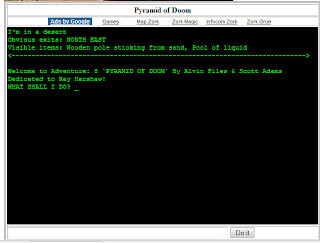 Our next installment takes us to Egypt for Adventure #8: Pyramid of Doom! We're back in the treasure-hunting biz, if we can survive long enough to lug our booty home. I opted to play #6 on the Commodore 64, emulated by Per Hakan Sundell's CCS64. I used to have terrible C-64 envy back in my TRS-80 days -- when it came to arcade-style games, the system's capable sprite hardware and amazing SID sound chip were the best available. 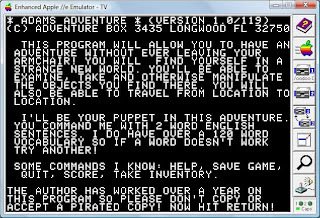 So I was surprised and a little bit dismayed to discover that the C-64 Adventure interpreter has so many differences from its peers, and some serious shortcomings. 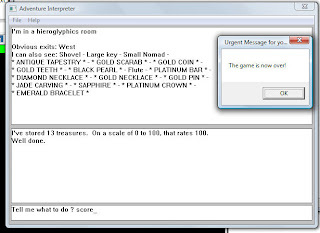 The C-64 interpreter uses text color coding to distinguish room descriptions, user prompts/commands, and game responses. But the text simply scrolls; it doesn't maintain Adams' most unique innovation, the persistent "room" window at the top of the screen. Instead, it plays like most text adventures, displaying the room description only upon entry (and even that's spotty), requiring frequent LOOK commands to keep track of what's going on. The interpreter also seems to require 4 characters of each verb and noun instead of 3 as on most other platforms, so all my old habits (like using INV instead of I or TAKE INVENTORY) had to be rethought -- I finally started using I instead of repeatedly mistyping INVE. I didn't find this one to be as tough as #5 -- every object has a sensible use, there are no external events to keep up with/wait for, and there isn't a lot of inventory juggling required. I was able to finish it in a few hours without any hint book references -- I did play it back in the day, but must have only played it once as I didn't really remember the solutions to any of the puzzles. Adventure #6 is all about discovery and figuring out how an alien universe operates without much hand-holding at all, which makes it a must-play in my book. If you haven't played it yourself, you really ought to do yourself the favor of trying it out before continuing. There aren't really any other characters in this game -- there are some plants and animals, but the absence of other intelligent life forms makes the environment seem very desolate and alien indeed. Signs and readouts, evidence of other intelligences existing elsewhere in space-time, become the closest thing we have to human contact. It's very atmospheric, and the spacesuit's constantly-dropping air gauge lends a sense of urgency to the proceedings that's more personal and dramatic than the external countdowns of #3 and #5. Get Adventure 7 "MYSTERY FUN HOUSE" from your favorite Dealer! Have you gotten your Adventure T-SHIRT yet? What I really enjoyed about this game was figuring out how the unfamiliar machines work. The hexagonal room that serves as a portal to other worlds has infinite settings, but only 6 of them go anywhere interesting, as hinted by the room's shape. Everything makes sense, but it takes some experimentation to put aside our human biases and adapt to the alien world. There are constant reminders that we are visitors here -- PUSH PLASTIC applies too much force, TOUCH PLASTIC works. We also have to learn the nesting habits of the Rigilian Dia-Ice Hound, discover the maximum air capacity of our space suit, experiment with our phaser settings, and take a crash course in Jovian mining safety. The geography of the small planetoid is covered by just a handful of rooms, and it doesn't take long to discover the quickest route from the player's Scoutship to the Cave where most of the action takes place. It is possible to finish the game on the space suit's initial air supply, with judicious gauge monitoring and WEAR/UNWEAR actions applied at the proper moments. There is an alien machine that will refill the suit's oxygen, but it's advisable to save game before starting to figure out how it works. There's not really much of a plot to Strange Odyssey otherwise -- this is basically Adventureland in space: wander around, discover the puzzles, come up with solutions given the available objects, confiscate the *TREASURES*. The design is very honest and there aren't any red herrings, but I liked its innovative flouting of one convention: it pays to examine the treasures in this game, as some of them have practical uses. And so our Strange Odyssey is over, with five treasures recovered and stored at incredible taxpayer expense, and no Greeks bearing gifts, star children, or K. C. Munchkins to speak of. It's a solid work of relatively straight science fantasy, and I really enjoyed the trip. Our next expedition promises to be amusing -- it's Adventure #7: Mystery Fun House! 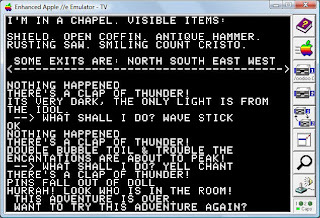 This is the only Adventure I've encountered in the journey so far that doesn't quite work in a modern interpreter -- one puzzle depends on a brief light illuminating the room just long enough to read the description and spot a significant object, and the display flickers by WAY too quickly in ScottFree 1.02 on a modern PC. So we'll be playing this one in its S.A.G.A. 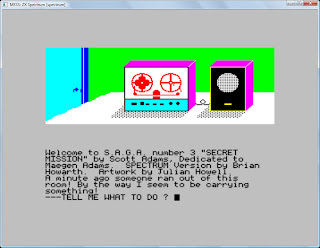 edition for the Atari 800 computer, via Richard Lawrence's Atari800Win emulator. The Atari edition has a painful game saving and loading process -- it requires creation of a separate formatted save disk (image) that has to be (virtually) swapped in and out of the (emulated) disk drive each time. But in general, the S.A.G.A. experience on the Atari 800 is better than on the ZX Spectrum we used for Mission Impossible -- the graphics are larger onscreen and much more accommodating, courteously disappearing to reveal the text whenever the player starts typing. There's also a graphic display of the player's inventory, though it's pretty hard to figure out what some items are from the pictures, and a funny "It's Too Dark To See!" graphic. I'm not positive about this, but I get the impression the Atari version's graphics aren't drawn procedurally with vectors and fills -- they don't take advantage of the Atari hardware's broader color palette, and appear to be bitmaps converted from the Apple II originals, complete with red/blue color artifacting. I was able to keep the S.A.G.A. graphics turned on for this Adventure, and I discovered that the room displays never quite map to my own mental model of the setting. I tend to think of NORTH as my forward-facing direction, side-stepping EAST and WEST so I can keep my internal orientation clear. I was reminded by this playthrough that text adventures exist primarily in the mind of the player -- we really do fill in the missing details for ourselves, with distinct and consistent ideas about where things are in each room. The in-game images are much more concrete, presenting an artist's vision that's usually very different from my mental picture. I don't think it's an improvement, though I understand the market conditions that made graphics an attractive addition to the series. I wanted to take this time (1 move!) to thank ALL of you out there in Adventureland for the fantastically warm reception Adventure has received! The Count is more difficult than the earlier games, and the plot is more complex, spanning three days of game time. It's quite a challenge to keep everything safeguarded and available at the climax, and there's a night-day mechanic that presents some great puzzles. Lots of inventory juggling, careful planning and frequent saving are required to achieve success. I had to resort to the hint book at one point, but it's no fault of the design -- I expect the solution would have come to me if I had been more patient and considered certain telling details. As much as I try not to rely on hints, they are always very much appreciated when I finally break down and look up a clue -- and Adams' approach to gently ramping up the nudging works well for me. I'll know the going is really getting rough if I start resorting to walkthroughs. As always, I encourage you to stop here and play the game on your own before proceeding. I'm happy to share MY impressions of each game, obviously, and I thank you very much for reading, but the joy of Adventuring is really in the experience itself. I hope my observations are illuminating and entertaining, but secondhand reports are no substitute for actually "living" each game as a player. A novel concept -- there's a "room" at the end of a sheet dangling from the ledge above, with a fold that's capable of holding objects so inventory items can be managed in this unusual location. I always like it when an Adventure pushes the engine to do something beyond (what I presume were) its original design goals. I resorted to the hint book to figure out how to keep myself from getting robbed of critical items -- the dusty room with a lockable door should have been an obvious "safe room", but I mistakenly focused on garlic and attempting to get through the night without sleeping. I also missed a better solution to another puzzle that would have saved me some headaches. I managed to complete a riskier playthrough by making frequent saves before attempting to climb down the sheet tied to the flagpole outside the bedroom window, allowing me to retry after my frequent random deaths. Looking at the hint book afterwards, I was reminded of the better way I lucked into doing it the first time I ever played -- it's a lot safer to tie the sheet to the BED and carry the loose end out the window. Either my brain was working better in 1980, or I hadn't noticed the ledge outside the window and assumed I needed a safe way to climb down from the bedroom directly. There's something there, maybe I should go there? The dumbwaiter is a great, atmospheric mechanism, with associated RAISE and LOWER verbs that move it from room to room. The only problem is that, unlike a real dumbwaiter, it's operated from the inside, and due to this implementation can become completely inaccessible if the player falls asleep while it's on the upper or lower level, forcing a restore/restart. The WAIT verb comes in handy for the time-based events -- once I had learned my way around the map, I found myself solving the available puzzles efficiently, and then waiting a few turns for the mail to arrive each day so I could continue. I like the way the player character's objective is established in The Count -- it seems obvious, of course, but there's an angry crowd gathered outside the castle gate. If we're completely confused and decide to just leave the castle, the ensuing events make it quite clear who we are and why we're here. It's a small thing, but it feels very organic and sure beats reading a note. I suspect this is a remnant of an earlier design, or a "freebie" behavior provided by the engine -- it's possible to drop the mirror and break it, or drop it on the pillow and keep it intact, but there's no critical reason to do either (though I did spend some time experimenting with it in the solar oven, thinking the lens/mirror combination might lead me to a means of dispatching Dracula.) The mirror is just there so the player can check on his/her health, but it's handled appropriately in the game world. The Adams sense of humor persists even at the most macabre moments. Light up a cigarette and smoke it to find Dracula's resting place. How? "There's a "COUGHIN" in the room"! The solution depends on a pun, but it's a fair puzzle, as there's a NO SMOKING sign on the wall of the crypt. When the player takes a no-doz tablet, the response is, "I'm real PEPPY now!" I wonder whether this was a reference to the artist who provided the pen-and-watercolor cover art for the early releases, before Adventure International could afford someone with an airbrush. Was the artist formerly known as 'Peppy' staying up late to meet deadlines, with chemical assistance? Was Adventure International in its heyday similar to Andy Warhol's Factory? Was that magic wizard dust strewn around cartoon Scott's feet in the catalog, or something more potent? Someone needs to write a book-length history of AI so we can solve all of these mysteries. I did run into one fatal bug -- if the player can't actually take the full-length portrait of Dracula because inventory is already full, the portrait still disappears from the room, and doesn't appear in the inventory. Unfortunately, the dark passage that's supposed to be discovered behind it does not appear, either -- the DOORLESS room remains so, and it's time to restart. As in other Adventures, it's possible to move around with an unlit torch if you know the map perfectly. This is handy for climbing up and down the sheet after dark, something I found myself doing on Day 2 to restock my cigarettes before sleeping. And I'm pleased to see that the S.A.G.A. artwork is pretty darn evocative too! Actually, don't. I'll leave the puns to the master. As promised, we will take occasional breaks from the Great Scott Project proper for asides and intermissions. Beyond the founder's titles, Adventure International also published works of interactive fiction created by other authors. I remember looking at these in the company's catalog once upon a time, fascinated by the possibilities, but never anted up the cash to buy any of them. 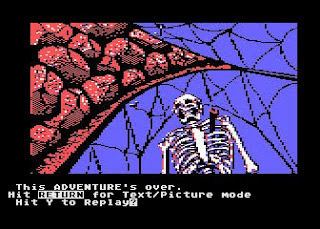 One of the earliest was Other-Venture #1: Classic Adventure, a port of the original Colossal Cave Adventure, and the series continued with several other games over the years. I spent a little time this weekend with the 1981 release, Other-Venture #2: The Curse of Crowley Manor, written by Jyym Pearson and Norman Sailer. 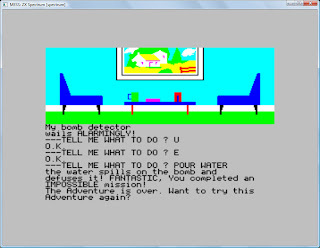 These games are definitely not running on the Scott Adams engine -- the screen layout is very different, the parser has uniquely aggravating quirks, it requires a disk drive, and the Other-Ventures did not appear on the same broad range of platforms as the Adventures did. It's always interesting to look at early works in any genre, before the conventions are fully established, because it's apparent that some experiments proved enduring and others were creative dead-ends. Crowley Manor is one of those failed experiments -- it's aiming for a dark, novelistic approach, but is hamstrung by some major issues. First, even on disk, there isn't enough text storage to create the literary feel the authors are aiming for, and typos and grammatical issues undermine it at every turn. When we LOOK WINDOW and are told "ITS LONDON AT NIGHT.." [sic], it kind of pulls us out of the story. We can find the date by looking at the furniture and discovering a desk calendar, which helps a little. But creating atmosphere with limited text was a real art form in the early days, and this game doesn't pull it off. There's a static graphic of a tower that I presume represents Crowley Manor at the side of the screen, but in the TRS-80 era it doesn't help either. YOU ARE IN A LARGE OFFICE. A WINDOW IS HERE AND SOME FURNITURE. A CALENDAR AND NAMEPLATE ARE ON THE DESK,A CLOSED DOOR IS E.
YOU ARE ON A LANDING. A HALLWAY LEADS S.
Why is the door only listed as part of "furniture"? (I actually have an answer to this one -- LOOK FURNITURE is being evaluated as LOOK, I eventually realized.) Why does opening the door force me to walk through it? Why do potential exits go unmentioned in any given room? Why do I automatically close the door without saying so when I come back into the office? Most problematic, the game is so intent on telling a set story that, as players, we feel like we're just along for the ride, trying to guess what command the game wants us to type in order to move the plot along. At the start of the game, we look around the office and wait for the phone to ring. If we try to leave the office before the phone rings, it rings just as we are leaving, and we are prevented from actually leaving. If we don't answer it, it rings some more. It will in fact ring indefinitely, until we answer it. We can't really do ANYTHING ELSE once the phone starts ringing, except ANSWER PHONE. This approach protects the player from missing a critical plot development -- but it also robs the player of anything resembling freedom. The constraints persist once we have dispensed with the telephone call -- in order to get to Crowley Manor as directed, we have to take a hansom cab. Fair enough -- we get into the cab, talk to the driver, ride through Trafalgar Square and see Big Ben, arrive at Crowley Manor... and then wrestle with finding a means to end the cab ride and get on with it. The driver will say "HERE WE ARE" forever, but EXIT CAB, PAY DRIVER, GO MANOR, GO DRIVEWAY, LEAVE CAB, THANK DRIVER and TIP DRIVER are all unsuccessful. OPEN DOOR produces "YOU CANT" [sic], which I trust is just bad punctuation and not a typo. GET OUT finally does the trick, and the cabbie takes 10 shillings for his trouble automatically, after having apparently rebuffed all previous attempts to pay him. It's all very scripted and formal, and the game is no help at all when it comes to making progress. 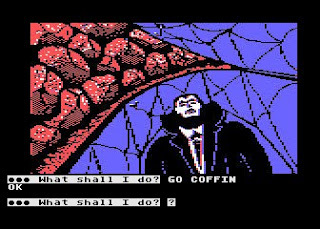 No adventure game can offer complete freedom, of course -- there are always restrictions. If we finish Zork I and decide that in Zork II we don't want to adventure any more, but prefer to cash in our treasures from the first game and set up a training school for novice adventurers, or perhaps a nice bakery, that's not really an option. Modern MMORPGs are better at that sort of thing, offering many more choices to the player, at the expense of narrative structure. But Crowley Manor doesn't even play fair -- it's downright painful trying to guess what it wants. THERE IS BLOOD SPLATTERED ON THE WALLS AND FLOOR..
Whoa! Didn't see that one coming. Was Inspector Strade invisible or simply extremely quiet and retiring, then? And if I can't see him, how on earth do I know his body is torn to pieces? Or is his body just now torn to pieces because I looked at him? This Inspector Strade seems to have serious self-image problems. Oh, wait -- I can LOOK STRADE in ANY room and learn that HIS BODY IS TORN TO PIECES. Perhaps I'm clairvoyant... oh, wait. I eventually find a key and unlock a cabinet, and Strade's body falls out. It is, in fact, torn to pieces. Silly parser. Enough! As this is just a side excursion from the Great Scott Project, I do not feel compelled to finish The Curse of Crowley Manor. But playing it even briefly confirms that there's a reason the Scott Adams and Infocom text adventures have endured where so many of their contemporaries have been forgotten. There was a lot of substandard product published in the golden era -- it's just easier to separate the wheat from the chaff with a little historical perspective. This was the first Adventure not officially written by Scott Adams himself -- it's credited to then-spouse Alexis Adams, although it's likely she handled the design and he did the implementation. If I may wax interactive-fiction-esque for a moment, the authorial voice is noticeably different from the Adventures we've played so far. Voodoo Castle depends less on puzzles than on discovering magic words and explicit clues -- characters and artifacts provide information that can't easily be guessed or worked out through trial and error. The map is straightforward and not particularly atmospheric -- there are no mazes, few odd connections, and many locations are generic: "a room in the castle." The player character is never really defined -- he/she could be servant, lover, or friend; I chose to believe I'm some sort of loyal aristocratic ally of the Count. I was able to finish the game in a couple of hours, but did get stuck at one point and had to resort to the hint book (details below). Once again, if you are playing along, this is a good place to stop reading and go explore on your own. Feel free to return when you've experienced it to your satisfaction. The game challenges the player to free Count Cristo from a voodoo curse, but the voodoo theme is treated fairly loosely -- there are Ju-Ju references and a pin-spiked doll, but no sign of zombi, poultry, snakes, or any other stereotypical aspects of vodou. Most puzzles are of a purely practical nature, while other events are based on decidedly Western chemistry, spiritualism, and superstition. FOR A READING JUST "SUMMON MEDIUM MAEGEN" TODAY!! BIRD SAYS:"ASK FOR ADVENTURE 5, -THE COUNT- AT YOUR FAVORITE COMPUTER DEALER. IT WILL BE LOVE AT FIRST BYTE!" An unusual grammatical inconsistency occurs if the player sips the witch's brew -- instead of the first-person phrasing typical of the Adventures, the game-ending response is: "YOU'VE BEEN TURNED INTO A BROOMSTICK & A WITCH RIDES OFF ON YOU!" As the puzzles are straightforward and the rooms nondescript, I found myself wishing more memory had been available for item descriptions -- there are a lot of interesting props in this game, e.g. Animal heads, a Knight's Suit of Armor and Labeled chemicals, but LOOKing at almost everything produces the generic "I SEE NOTHING VERY SPECIAL" response. Alexis chose to dedicate the game "to all MOMS! ", and I wonder whether domestic frustrations inspired the maid character, who appears just long enough to chase the player into another room whenever he/she tracks soot through the ballroom; there doesn't appear to be any other purpose for this event, so I suspect it's a bit of an in-joke. There's a bit of a cop-out in one puzzle -- trying to break the window yields "THIS GLASS CAN'T BE BROKEN" as a response, with no further explanation as to why. It's a coherent reply, it just seems like some sort of magical justification could have been dreamed up. There's also an unforeseeable dead end, as was common in the text adventure era -- entering the jail cell without the saw in hand condemns the player to death from starvation, boredom and/or the reset button. Ju-Ju man says: "My bag is now yours! Its magic will help you -CRACK- the curse!" 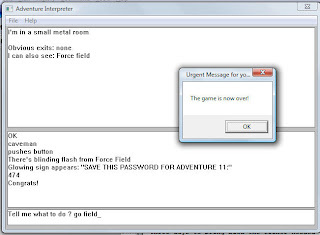 As I neared the end of the game, one annoying situation drove me to the hint book for help. I couldn't figure out how to get the magically slamming window to stay open -- there was no opportunity to nail, prop, or break it open. The first decoded clue urged me to GET LUCKY, but as a suitable partner was nowhere to be found, I concluded it must have something to do with the two good-luck charms I had acquired. I discovered that I was stumped simply because the two items are not interchangeable -- the medium had hinted that I should keep such a charm on myself and my friend, so I had left the clover near the Count's coffin and carried the rabbit's foot myself. As it turns out, I needed to drop the rabbit's foot in the coffin room -- an "ON WHAT?" prompt then allowed me to place it explicitly ON CRISTO, an option not available for the four-leaf clover. Then with the clover in my possession, the window magically stayed open and I was able to finish the game. Not an intentional puzzle, per se, but it certainly puzzled me. Whew! And thus we have un-cursed our dear friend/patron/employer/lover, and a post-comatose SMILING COUNT CRISTO seems quite pleased to be out of his coffin and none the worse for wear. At least I like to think his smile is genuine, and not a symptom of premature rigor mortis and rictus setting in. So the Count is not down for the count after all. But we are, brave Adventurers! 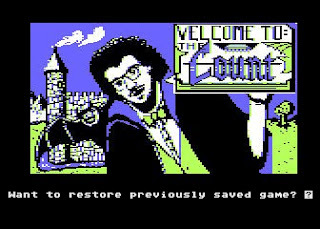 Up next -- we embark for Transylvania with Adventure #5: The Count! Good morning, your mission is to… and so it starts. Will you be able to complete your mission on time? Or is the world’s first automated nuclear reactor doomed? This one’s well named. It’s hard, there is no magic, but plenty of suspense. GOOD LUCK….. I couldn't figure out where I was, which way to go, or even what I was looking at (MACHINE? REEL-TO-REEL? SPEAKER?). Fortunately, after temporarily giving up and reverting to the original text version for comparison, I realized there must be a solution. I buckled down and looked up the Spectrum S.A.G.A. documentation. D'ohh! The ENTER key toggles between graphics and text. All set to go! I did finish this game once upon a time back in the 1980's, so it only took me a couple of hours to re-work my way through, technical issues and restarts included; a final replay took less than ten minutes. As always, at this point I urge you to stop reading if you intend to play the game on your own, because my further observations may ruin a few surprises. Go, play, save the world, come back. Digital bits don't just randomly decay on the Internet like they did on 1980's floppy disks. A navigational parser anomaly I noticed in Pirate Adventure resurfaces here -- only U works, UP is not actually recognized. I think it's a dictionary issue for the interpreter at large, because UP is used as a noun here, as in GET UP. I accomplished something new on this playthrough -- I finally figured out how to use the movie film cartridge in the projector. The (a?) correct command is LOAD CARTRIDGE. As an adolescent adventurer, I got stuck and never did pull this off as intended -- repeated attempts to PUT CARTRIDGE just dropped the film next to the Projector, producing no change in the green button's behavior. Even the official Adventure International Hint Book provided no direct clue as to what I was doing wrong. I ultimately resorted to soft-resetting my TRS-80 Model I and PEEKing around in memory, where the program data was still stored, to find the related text. It became sort of a meta-adventure at the time, but it's satisfying to finally see the expected response in context. Of course, watching the visitors' movie isn't absolutely essential to finishing the game -- trial and error during the endgame effectively discovers the same information. And skipping the film altogether shaves quite a few moves off the race against the bomb's constant countdown, lessening the time pressure considerably. One serious limitation of the S.A.G.A. engine is that objects are generally only displayed in the rooms where they first appear -- there's no graphical depiction of objects that are dropped elsewhere by the player or materialized by the game logic. 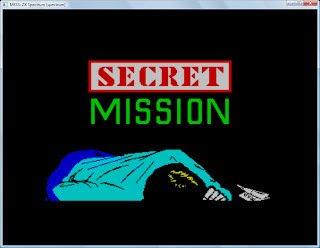 This is a real problem in Secret/Mission/Impossible, because the suicidal saboteur drops dead in a random location. With the graphics turned on, it's impossible to find the body. Only the text mode indicates the presence of "Dead saboteur." There are some nicely handled clues and a solid real-world consistency to the puzzles -- shaking the mop to find the blue key would be totally random, were it not for the piece of yarn found on the saboteur's body after he has hidden the keys. Signage also provides useful hints toward puzzle solutions without initially seeming to do so -- as it turns out, the Break Room is indeed the only safe place to deal with liquids. But fanfare and ticker-tape parades are not for us. We take quiet, honorable satisfaction in having saved the world (or at least some regional portion of it) from nuclear armageddon. Next time, we muster our jou jou and venture into supernatural territory with Adventure #4: Voodoo Castle!